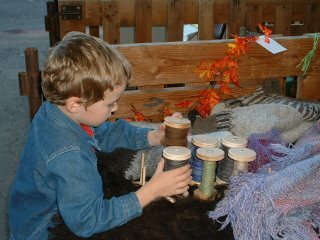 I got to attend the Oregon Flock and Fiber Festival (OFFF) in Canby on Friday and Sunday, and it wasn't nearly enough time! I would have liked to have browsed more among all the vendor booths, and met more of the Shetland sheep and their breeders, but I had to prioritize. 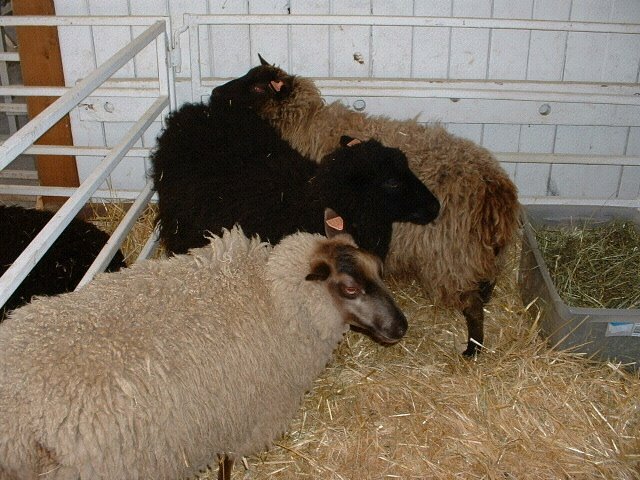 First of all, I was there to meet and hopefully choose from Lois Moore's yearling ewes. Second, Lois agreed to come to my place and give me feedback on my sheep if I could provide transportion. 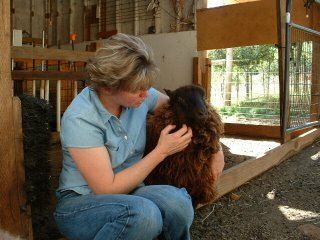 Third, I had agreed to help Susie Sizemore show her sheep, since she was short-handed. And fourth, Lois said I could try out her spinning wheels and learn to spin. Those four objectives were accomplished and then some, so I was busy! 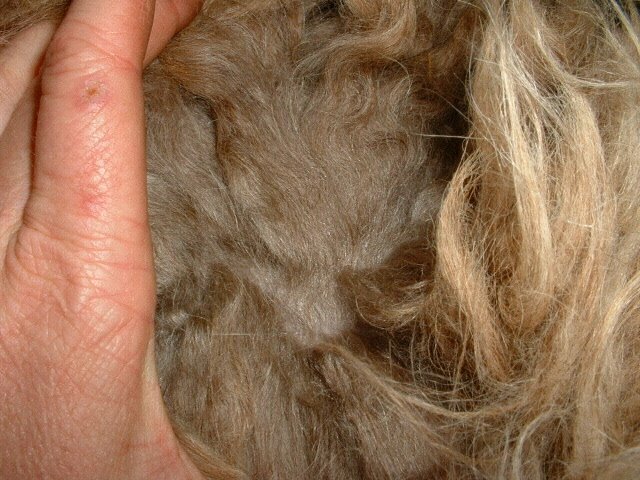 Valentine's lustrous, silky fleece was indeed a luscious latte color, and she was by far the friendliest of the three. But Titania's head drew me in like a siren's call. Fleece or head, fleece or head? I couldn't bear to say no to either! 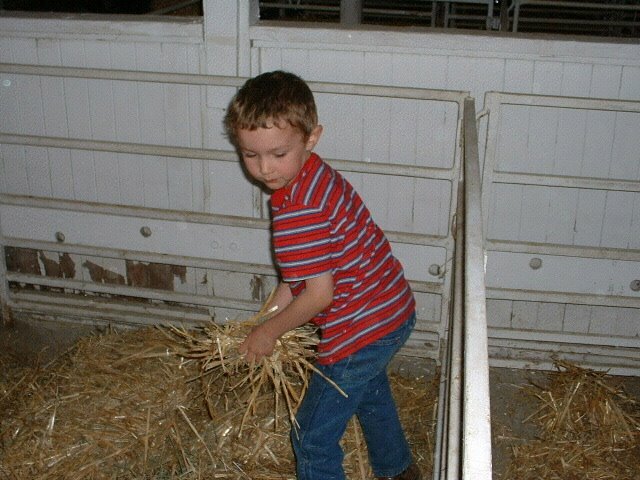 While I pondered, Brian followed Susie Sizemore around and helped Wally Rutledge spread straw in his stalls. He was a really good boy. Then we drove Lois to Boulderneigh to see our girls. 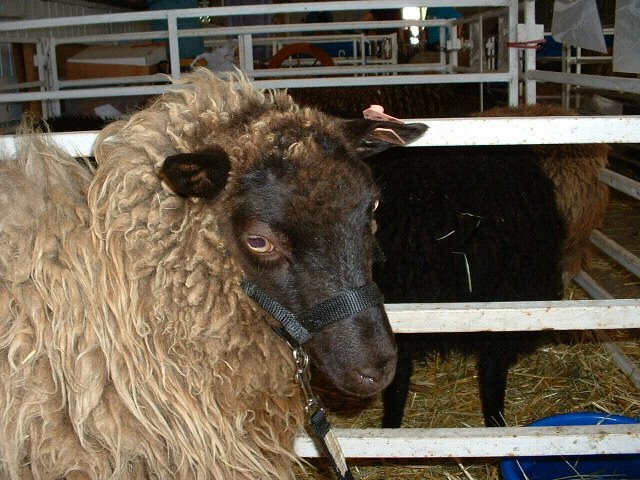 Lois made me feel good about my taste in sheep, advised me on what to do with Dinah's fleece, and met my horse Russell. Then back we drove to Canby, with me none to the closer to a decision. Lois advised I sleep on it. It was more like not sleeping on it. I also prayed about it, because I know God wants to be involved in even the smallest details of our lives, and He knows which little Shetland would work out best at Boulderneigh. 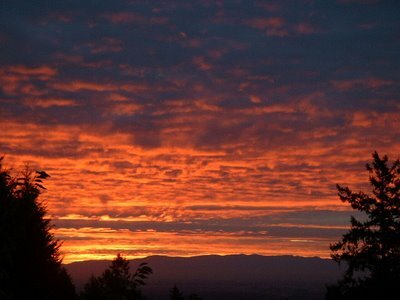 As I drove back to Canby Sunday morning, I still wasn't sure what to do, but it started jelling. 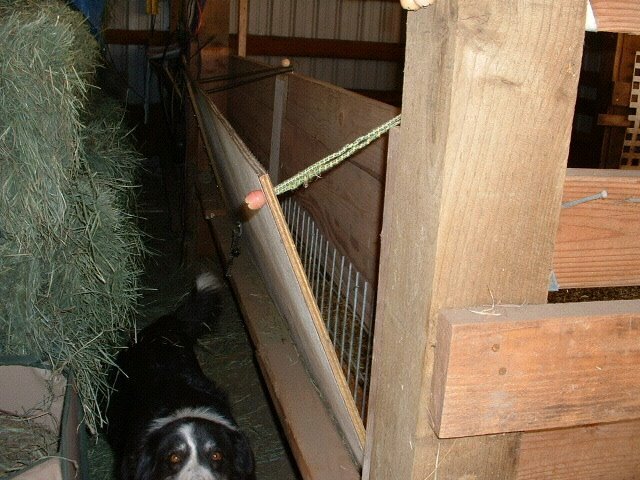 When I walked into the barn and Valentine greeted me I knew, and I told Lois, "I'm taking Valentine." The joy of making the right choice grew throughout the day, and there have been no second thoughts! 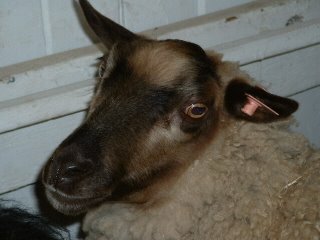 My sweet Valentine was hard to photograph, because she would always come up for attention. So I had to halter her and tie her up to get these shots. Valentine went back with Lois to Halfway, Oregon to be bred, and will come to her new home at Boulderneigh after that. I can hardly wait! It was a beautiful Sunday. It started out with this sunrise over the Cascade Mountains (which our biggest windows face). A change of weather last week brought much needed rain and left some clouds for a stunning palette. 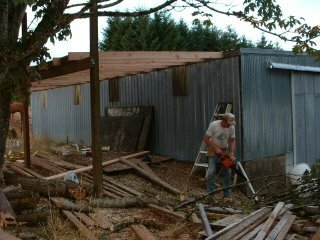 Except for the yellowjackets, which are plentiful and aggressive this time of year, it was a perfect day for working on our barn addition. (Thankfully, no one was stung.) Rick went to an early-morning meeting, and brought home some "big boy" tools for Brian to help with: a real hammer loop and hammer for his belt, and a 10' tape measure to put in his pocket. As you can see, he was very pleased! Today we put up rafters. Found we had to cut off one more branch from the maple tree for the last rafter to fit, so that meant more leaves for the sheep and a little more firewood. It may not look like we accomplished all that much, but we know how much work it was, and as hard work always does, it made us feel good. So did a tasty supper of cheese and homegrown tomato sandwiches on homemade bread, with just picked sweet corn on the cob! I'm glad fall is in the air and rain is back in the forecast, but I am sad for the end of garden season. So I unraveled the whole thing and started over. This time, I made SURE I maintained 18 stitches per row as specified in the pattern (how DID I manage to vary that number so much?) after clarifying another question I had by a more careful reading of the "How to Knit" instructions I downloaded. 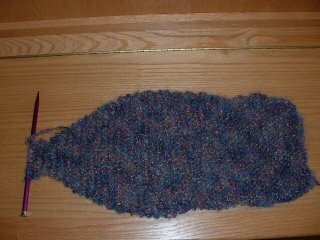 Well, the scarf turned out better, but it's still too wide and too short for an ideal scarf. Brian, however, says he likes it and wants it to be his. How could I say no to a cute little boy in camo PJs? Third time's a charm, they say. I took another skein of the Moonlight Mohair I'd bought (Rainbow Falls this time) and decided to deviate from the instructions in hopes of producing a decently sized scarf. I cast on only 12 stitches, and a few short days later, voila! A real, useable scarf! Brian took this photo himself, his first experience with my digital camera. I'm going to have to learn how to knit more than scarves if I'm going to do justice to Shetland wool, but it's a start and I'm pleased. 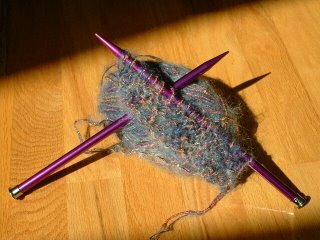 I enjoy knitting, and will soon get to learn if I enjoy spinning, too! This week Brian and I have paid a visit and been paid a visit, and both were lovely. As before, Susie was a gracious hostess. 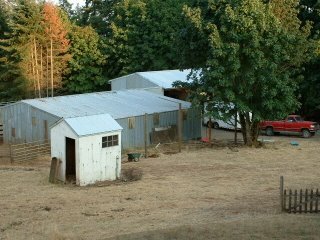 Her farm is picture-perfect, from the landscaping and home in the front to the vegetable and cutting gardens and sheep quarters in the back. 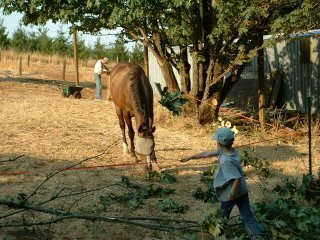 Wish I could have her do a "farm make-over" at my place, but I'm afraid I'd still need a professional grounds crew to maintain it all! (The inside of her home is picture-perfect, too, with lots of sheepy art and accessories.) Anyway, after taking photos of the feeders, we HAD to love on Susie's Shetlands. 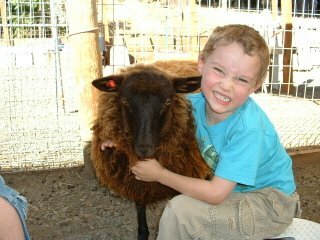 Her main PR agent is this moorit ewe lamb named Ruby Jewel. She does her job well! After tearing ourselves away from Susie's friendly girls, we stopped by the house to wash our hands. Then, somehow, we diverged into fiber, and she showed me her homespun yarn, demonstrated her Louet spinning wheel, and showed us the gorgeous blankets MacAusland's Woollen Mills makes from her fleeces. (I had no idea such a service existed, and they are SO reasonable.) 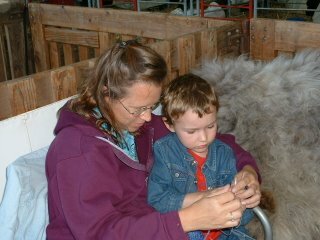 I thought tearing myself away from her sheep was difficult - I could have stayed a lot longer and enjoyed every second of it! I'm really looking forward to another visit soon, my first "Shetland Visitor." 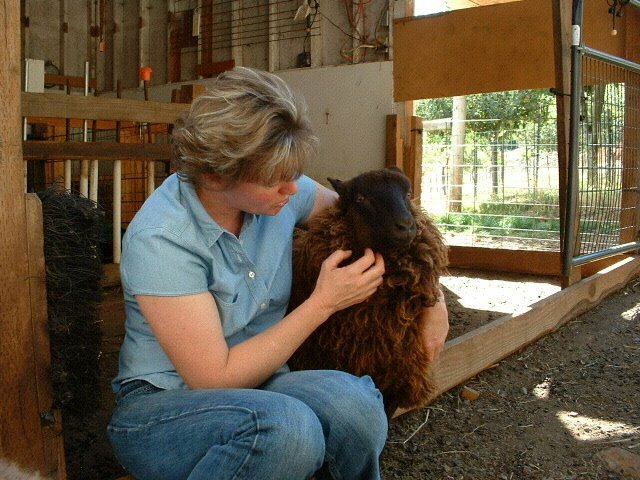 Lois Moore of Stonehaven Farm is coming west for OFFF (Oregon Flock and Fiber Festival) next Thursday, and she has kindly consented to let me pick her up and bring her to Boulderneigh to help me evaluate my sheep with her experienced eye. She's also offered to help me learn to spin on her wheel at OFFF, so I can figure out if this is something I want to pursue and if so, what kind of wheel I might like best. Lois has been a tremendous shepherd mentor to me, and I owe her a huge debt of gratitude. 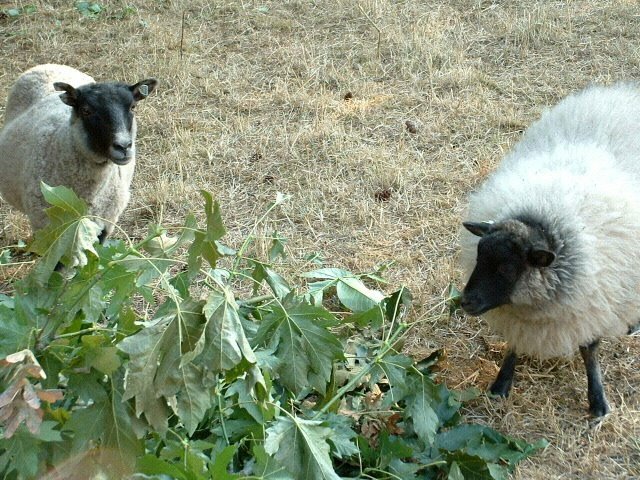 Thank-you, Lois -- and my sheep thank you, too! Okay. 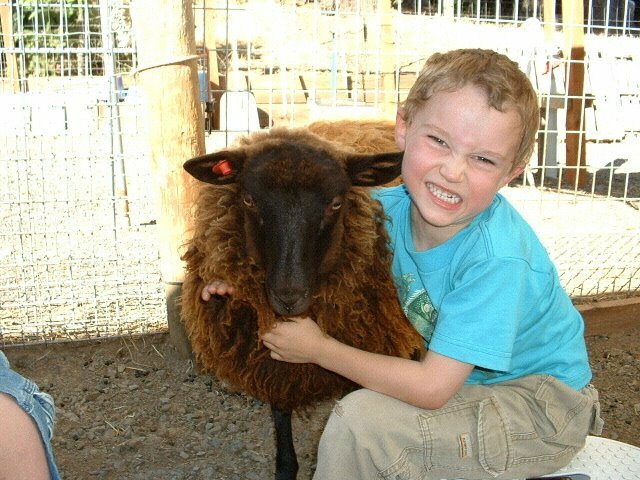 We got Shetland sheep because they were the perfect fit for our family, our lifestyle, our farm deferral project. I intended to enjoy the little dears while selling a few select lambs and fleeces. 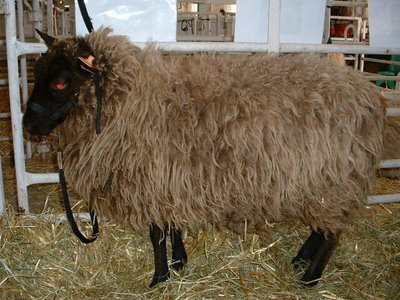 I did NOT intend to do anything with their wool myself, besides maybe shearing it. No knowledge, little interest, no time - or so I told myself. 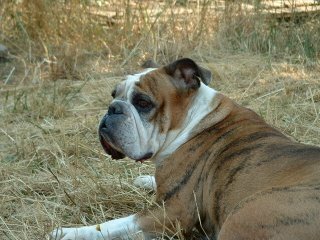 But there were so many fascinating things to learn about the breed, and I was (am) an eager student. And with more knowledge about the creatures came more interest in their wonderful fleeces. Now I'm hoping to learn about spinning through acquaintances and the local spinning guild, to see if that's something I want to pursue. Then I got to thinking about the pointlessness of producing yarn if I can't do anything with it. And some of the handspun I saw at the State Fair was gorgeous, begging to be used for something special. Even my son admired it. Not only did Brian admire the Shetland yarn, he seemed fascinated by a new friend's knitting project. He watched, quietly and keenly, as she worked. When she offered to let him help a little, he took the opportunity eagerly. 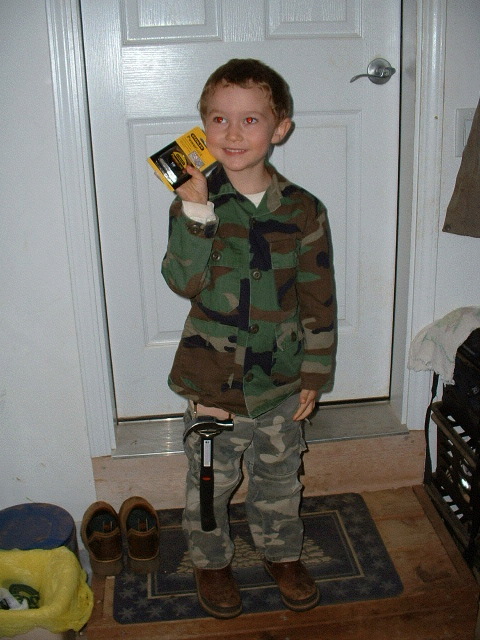 How young can a child learn, I wondered? I had to stop at Wal-Mart for a prescription before heading home. The craft section sounded its siren call. I looked. I saw some stunning yarn - on sale. I succumbed. 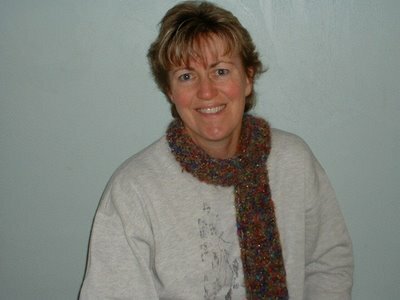 How hard could knitting a scarf be? 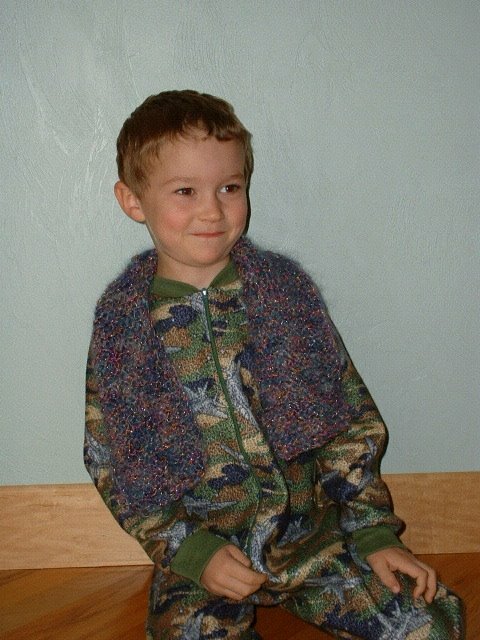 So I went home, downloaded "Learn to Knit" from www.lionbrand.com, and went to work. Slowly. Clumsily. Still, it was oddly exciting, and satisfying. Since this morning, my project has gained several inches, and I no longer have to consult the instructions. (I also went back to Wal-Mart today and bought three more balls of yarn - Christmas is coming!) Go ahead; chuckle among yourselves and look knowingly at one another. Better plan an intervention, too. Looks like I'm going to be a card-carrying member of Fiberholics Anonymous! By the way, Brian wants to know when I'm going to teach him how to knit. Guess what they say is true: addictions run in families. This weekend we started on a 12'x40' addition to our barn that will be half tractor implement shed, half sheep shed. Our current sheep fold is simply the enclosed breezeway between our horse barn and our "barn shed," as Brian calls it. 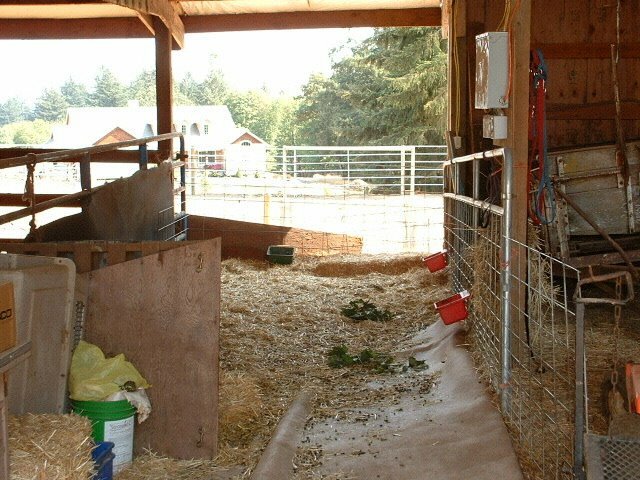 The breezeway is certainly a well-ventilated space that has worked for our tiny flock in all but the coldest weather, but we never intended for it to be permanent. 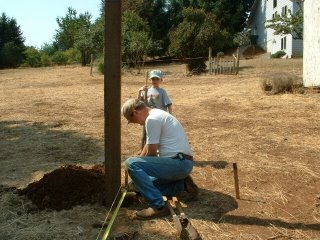 and me (hey, I helped set posts, too!). 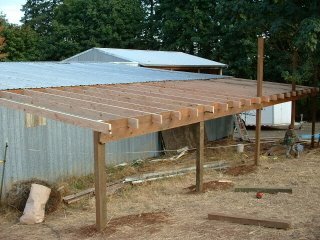 Five posts now await headers and trusses so they can be trimmed down to size.